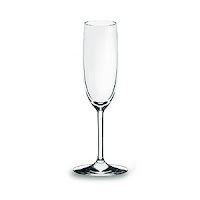 I bought these champagne flutes because they looked good on the shelf. From above, you couldn’t see that the body of the glass was too long, much longer than the stem and too wide too. I was mainly concerned with finding glasses that didn’t have a lip around the top. I like a clean feel when I take a sip so I can concentrate on the wine not the glass and these German-made glasses didn’t have a thick lip. It was only when I poured wine into them and took a sip that I noticed that, because the stem was so short my hand was right next to the glass, a proximity which causes the wine to warm to the temperature of your skin, not a good thing when you're drinking champagne and which is why wine glasses have a stem and a foot in the first place, to keep hand heat from altering the delicate aroma and bouquet. 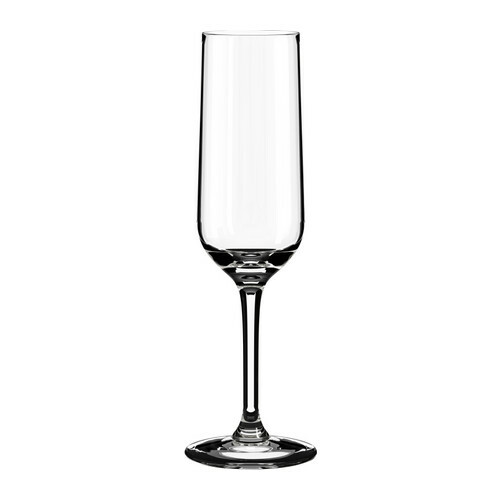 Besides, a long-waisted glass doesn't look elegant. As I tilted the glass to sip, I also noticed that, by the time the wine reached my lips, my nose was touching the opposite side of the glass. Because the body of the flute was so long and so wide at the bottom and so narrow at the top, it resulted in unwanted nose contact. This is not good. I also discovered that this overly long glass is hard to clean, you can’t get all the way down to the bottom with your fingers and a brush is too wide to enter the narrow top. Fiddle-dee-dee, you might say, a wine glass is a wine glass, wine is wine. You can drink wine out of a tin can. But that would be wrong. A properly designed glass is an important part of the thrill and delight of tasting fine wine. 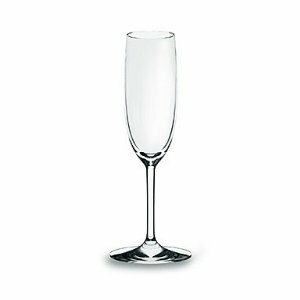 The reason for narrow champagne flutes is that a wider glass would permit more bubbles to escape and the wine to warm faster. Two reasons why champagne coupes were abandoned. Form follows function is the first rule of any design. When your tongue expects the fresh explosion of green grapes and a tingle of bubbles but instead it’s your nose that gets hit by the opposite side of the glass, it’s a bit of a shock rather than a pleasant taste experience. 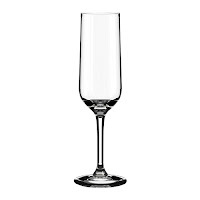 You want your champagne flute not to have a distractingly thick lip, to be fairly straight and narrow and to have and a nice long stem so the delicate nectar stays cold longer and the bubbles bubble longer. Yes, you’ll need to refill more often but the wine will be cold and bubbly, instead of warm and flat. Besides, a well-proportioned glass is a pleasure for the eye and the hand as well as the tongue and the throat and makes a nice sound when you flick it with your fingers.